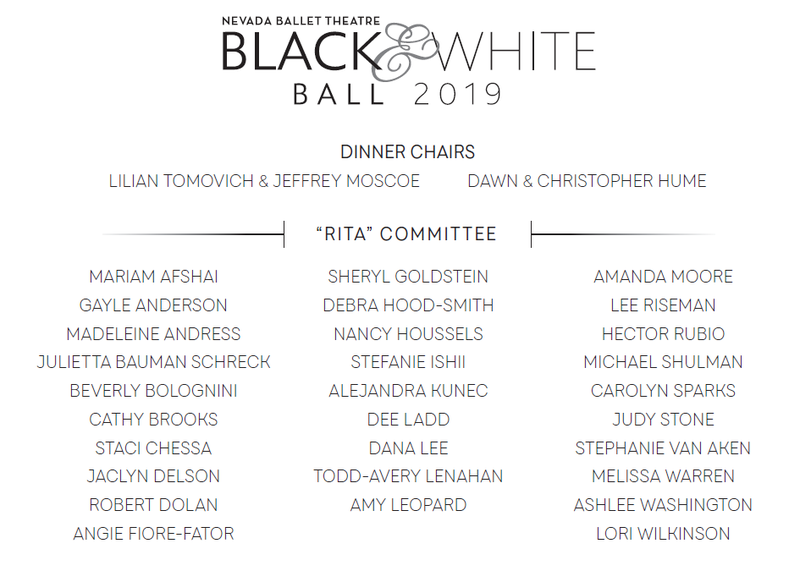 The 2019 Black & White Ball honoring legendary Rita Moreno is NBT's largest annual fundraiser. I have read and agree to the Terms and Conditions and give my consent to Nevada Ballet Theatre to process my personal data. I understand I can revoke this consent at any time. Nevada Ballet Theatre has arranged a block Aria Resort & Casino Deluxe rooms. To reserve your Aria Deluxe King or Deluxe Two-Queen room, you may book online or by phoning Special Event Reservations at: 866.359.7757 or 702.590.7757. Quantities are limited. The Diamond VIP Reception, is a private meet and greet with the Woman of the Year. a photo on the VIP Red Carpet with our 2019 Woman of the Year - Rita Moreno. The Diamond VIP Reception is available to Diamond Table Sponsors and their guests only. If you are not ready to go home after an exciting night celebrating with NBT at the Black & White Ball, this year's Ball will feature an After Party at JEWEL Nightclub. This After Party is included with Diamond and Platinum tables and may be added to the Gold Table for $1500. Enjoy a private space on the 2nd floor for Black & White Ball After Party fun! Click here to purchase your Black & White Ball table!